December 2009 Newsletter - we keep winning! U or P case: The State Supreme Court agreed with us, with the New York State Attorney General, and with the NYS Division of Housing and Community Renewal (DHCR) and upheld DHCR's regulations that say that just leaving Mitchell-Lama is not a "unique or peculiar circumstance" justifying a rent increase. So those of us in rent stabilized apartments have one more victory under our belts. While the owners (Gluck and others) will appeal, the more victories the stronger our case. Judge Alice Schlesinger wrote a very thorough opinion. Appliance Surcharge Overcharge case: DHCR (the state housing agency) rule that Gluck overcharged tenants who had been paying appliance surcharges under Mitchell-Lama. The first tenant to receive her letter is due $832.02 AND her rent will be rolled back by $33. Click here to see two of the pages she received. If you signed on, just wait for your letter; from DHCR - and then we'll see if Gluck pays up as ordered. (He could also appeal.) If you did not sign on but had an appliance surcharge under Mitchell-Lama that became part of your rent when we entered rent stabilization, you can still do it now. Contact Sue for information. And none of this could have happened without the strong support of tenants standing together - and contributing to our legal fund. Treasurer Joan Browne and Barbara Geller are putting together a summary of each tenant's contributions for dues ($25/household for new tenants; and $10/year thereafter), and the legal fund. We know money is tight around now, but any contribution we be welcome as we gird our loins for the next round of the U or P case and any other appeals. Cold? If your apartment is chilly, have the staff check the radiators. Then keep a heat log: note the temperature in your apartment when the outside temperature is 55 degrees or colder, between 6 AM and 10 PM. The inside temperature during those hours must be at least 68 degrees. Call Lucio Pedraza, the building manager, 212-222-4430, or e-mail him and then call 311 to report the problem. You are not required to give your name to 311. Then give the 311 complaint number to Sue. Our next meeting will be on Wednesday, Jan. 20th at 8 PM in the Community Room.Old and new tenants welcome - but please bring a chair. We'll be voting for two new executive committee members (Prudence is retiring and we have one opening from earlier.) Contact Election Committee head Alitha Mobley in 5A if you need more information. A new intercom - although we still need a board showing tenants' names and code numbers (but not apartments) in the front entrance way. DHCR sent an inspector to the building and found that we had received most of our demands, and subsequently terminated the complaint in a letter received by those who signed on. It ain’t perfect, but we've done pretty well! Tell our Legislators to Pass Our Bills! S 3326-A /A. 9230 which will put into rent stabilization all buildings that leave or have left Mitchell-Lama (and project-based Section 8) regardless of the year built, and without "unique or peculiar circumstances" increases. S.2237 / A.2005 which will repeal vacancy decontrol, so that owners may no longer remove vacant apartments from rent stabilization. The bill would re-stabilize market-rate apartments whose rents were under $5000 as of January 1, 2007 - at whatever the rent was that month. And many more, that you can see at www.save-ml.org . a petition to our State Senator Bill Perkins - a co-sponsor of S.3326 - urging him to persuade his friend John Sampson to promote the bills and put them on the agenda for a vote. And since we won the first round in court of the "unique or peculiar" case, please contribute so we have enough funds for the inevitable appeals! Contact your floor captain or treasurer Joan Browne. 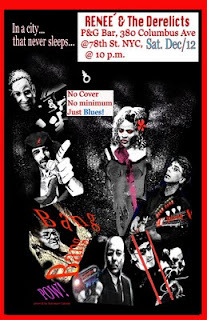 P&G Bar, 380 Columbus Ave. @ 78th St., New York City, this Saturday, Dec. 12th at 10 PM. (No cover, no minimum, just jazz). We Won (1st Round of) U or P Court Case! sent the case back to DHCR to determine within 150 days the thousands of "unique or peculiar" applications pending regarding 24 buildings state-wide. Click here for a copy of the decision. Read below for a SUMMARY. THANKS to our lawyer, DAVID RATNER of Hartman, Ule, Rose & Ratner, for doing a terrific job! Justice Alice Schlesinger of the State Supreme Court in Manhattan ruled on November 25, 2009 in favor of the tenants in the Columbus 95 and Highbridge House cases. (1) the KSLM (Westgate) decision only gave landlords the right to APPLY for "unique or peculiar circumstances" rent adjustments, not an automatic right to GET such increases. The DHCR regulation is consistent with the KSLM decision by the State's highest court, the Court of Appeals. The "aside" by the Appellate Division (the mid-level court) about whether leaving Mitchell-Lama is a "unique or peculiar circumstance" is not binding, in part because it is based on three letters from DHCR responding to a speculative (hypothetical) question in a different matter. (Similarly an "aside" - legally called "dicta" - by Judge Stone earlier in this case is not binding because it was superfluous to what he was actually ruling on.) It is also not valid because the Court of Appeals did not reference that point in modifying the decision. The DHCR regulation is within that agency's legal mandate, filling in the blanks left by a statute. (3) Where a law (including a regulation) changes while an application is pending, generally the NEW law applies. In this case, there is no difference between the new regulation and DHCR policy before that regulation. (4) The DHCR regulation is constitutional (the regulation was within DHCR's authority), so the court dismissed the owners' claims of unconstitutionality. (A) She lifted the stay (hold) a former judge had imposed on DHCR, and ordered DHCR to DECIDE THE U or P APPLICATIONS WITHIN 150 DAYS for all 24 buildings whose applications are pending - including ours. (B) She did NOT order DHCR to apply its "old" (pre-regulation) policy, in part because that is not legally required, and in part because the old policy and the new regulation apply the same policy.